GET $9.99 OFF SHIPPING BY PURCHASING THIS PRODUCT! CLICK HERE TO ACTIVATE YOUR COUPON FOR $9.99 OFF S&H! Blower Motor Resistor with 4180 Repair Harness, Combo / Chevrolet Avalanche, Silverado, Suburban, and Tahoe, GMC Sierra and Yukon with manual a/c. Total: a savings of over $200!!! Our blower resistors are always the latest design, genuine ACDelco parts. We say NO to cheap knockoffs, old designs and seconds that you might find locally and so should You! Our 4180 harness connector is made in the USA using Delphi components (current OEM supplier to GM) and according to the latest GM design standards! It also comes complete with high grade seamless splicing terminals and dual wall heat shrink tubing with built in sealer. This is NOT the correct resistor combo for Chevrolet Trailblazer and/or GMC Envoy. To order a resistor combo for your Trailblazer or Envoy, please click here. PLEASE NOTE: This does NOT fit the Canyon or Colorado model trucks. If you have a Canyon or Colorado, please click here to find the correct resistor. Click here for repair information on this product. I need my blower working TODAY!! The weather is REALLY BAD!!! What can I do to get it working until I can order my parts from The Electric Connection? The most common cause of no blower operation is a failed terminal on the black wire, position "E" of the seven wire connector. If you lost most or all speeds at one time this is likely to be your problem as well. 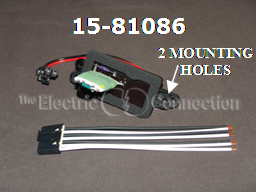 It is easy to bypass in order to have some blower operation while you await your new parts from The Electric Connection. Locate the black wire at terminal "E" of the seven wire connector and cut it about two inches from the resistor. Locate the black wire that connects to the blower motor and cut this wire about two inches from the resistor also. Now join the black wire from the seven wire connector to the black wire that is still connected to the blower motor. Doing this simply reconnects the original ground supply to the blower motor but it does it outside of the resistor assembly. High or #5 speed should not work though beacuse the resistor's internal high blower relay no longer will have a ground supply. If the high speed happens to work it is only because the relay is stuck. If the relay is stuck, it may not turn off when the key is switched off, unless you tap on it or disconnect the wiring to the blower motor. Now just order your parts from The Electric Connection and you will soon have your system fully working to the original design. Need help identifying which resistor you need? Click here. Please provide the application in the customer comments box at checkout, or Contact Us with the application. There are two different resistors available in this combo kit, and we must have this information before your order can be processed. Each combo is priced equally, but the application is important to ensure you receive the correct resistor. We need to know the year, make and model as well as the a/c type (manual or auto). We also need to know if your vehicle has bucket seats and a floor mounted center console. If you would like to look up the application yourself, you may do so by clicking here. From Joseph Howard of Crawfordsville, Indiana on 9/30/2018 . From Anonymous of Tacoma, Washington on 12/6/2017 . From Dennis Haas of Largo, Florida on 9/13/2017 . From Peter Monroe of Richfield Springs, New York on 8/25/2017 . From Steve O of Hertford, North Carolina on 8/8/2017 . 9/25/2013 – I did the bypass of the ground supply as suggested for a temporary fix. "Doing this simply reconnects the original ground . . .
10/14/2010 – I have a 2003 GMC Sierra. Heater blower does not work. Replaced resistor and harness. Worked for 2 months. Removed blower . . .
9/16/2010 – 2005 Chevy Tahoe Z71 auto controls. HVAC started acting up. First, back seat was getting hot air, no cold. Started working . . .
9/9/2010 – I have a 2005 Chevy Suburban, 6L, auto 4x4, dual climate control system. After reading all the Q & A, it sounds like I need . . .